The E-Textbook Experiment Turns A Page For years now, people have been expecting electronic textbooks to take off in a big way: They're cheaper, lighter and a logical next step for students of the digital generation. Still, traditional textbooks have prevailed -- until now. Enter the iPad. Brandon Hamilton, a senior and economics major at Reed College, does schoolwork on his iPad by the college's Old Dorm Block. For a few years now, people have been expecting electronic textbooks to take off in a big way: They're cheaper than traditional textbooks, easier to carry around in a backpack, and seem like a natural progression for students who have grown up playing and working with digital devices. Despite all that, traditional textbooks have prevailed -- until now. The game changer, according to Matt MacInnis, may be a little thing called the iPad. "We give guided tours through complex concepts," he says. "So rather than seeing a picture of a cell dividing and then having a big, long caption, you can now tap … through all the different phases of cell division and see those things unfurl in front of you." He says that changes things because, until now, e-textbooks have basically just been bad imitations of their paper counterparts. "When you just copy the stuff that's on a page and slap it onto a computer screen, you really don't get the same effect that was intended for what you have on paper," he says. Alex Montgomery-Amo, a professor of political science at Reed College in Portland, Ore., couldn't agree more. Reed College is one of a number of universities around the country that have been experimenting with the iPad, turning Montgomery-Amo's nuclear politics course into something of a laboratory for electronic readers. 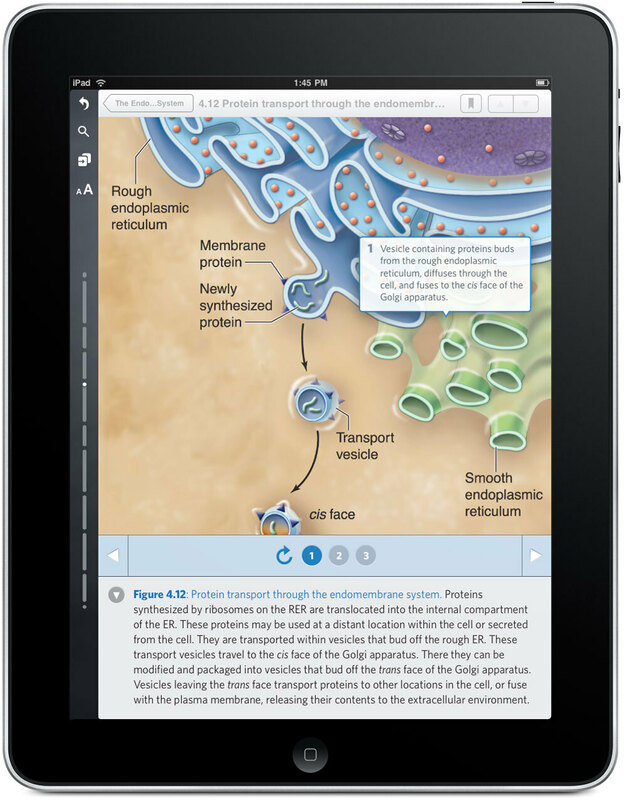 This interactive diagram of a cell digesting a protein appears in Inkling's iPad version of Peter Raven's textbook Biology. Last year they tried out the Kindle and this year they've been given free iPads to test. Montgomery-Amo says they're hoping to have better luck with the iPad than they had with the Kindle. "That went … I think horribly would be a good way of putting it," he says. "The problem is that the Kindle is less interactive than a piece of paper in that the paper, you can quickly write notes in the margin or star something or highlight something, and the Kindle was so slow at highlighting and making notes that the students stopped reading them as scholarly texts and started reading them like novels." The result, according to Montgomery-Amo, is that his students didn't understand the material as well as they did when using a traditional textbook. To make matters worse, he says the Kindle proved unable to keep up with the class discussion -- it would take half a minute to load a page and by then, the discussion would have lost its momentum. The professors are not the only ones who are happy with the iPad's performance. Senior Michael Crane and junior Rebecca Traber say that even though they've only had their iPads for a few weeks, they've already been pleasantly surprised. "I thought it would just kind of be a fun toy," Crane says. "It still is a fun toy, but it also … makes it really easy to read articles for class. In fact, I read pretty much all my articles for all my classes on this now. The instant boot time I think is really nice because if I have half an hour somewhere, I don't have to set up my laptop to get my articles out." "I actually found it startlingly easy to annotate," Traber says. "You just swipe your finger and you highlight." The students have the option to buy their iPads at a good price at the end of the year, and while Rebecca Traber says she's thinking about it, junior Tevon Edwards doesn't think it's worth the money. "It doesn't solve enough problems for how much it costs," he says. "For most classes, I can use a laptop … and there are programs I could use for a laptop that would also allow me to annotate," Edwards says. Traber also has her doubts. "While I like reading on it better than reading on a laptop, in terms of creating anything -- like writing papers or even e-mails -- it's ridiculously hard," she says. "I don't like the keyboard at all." Crane, Traber and Edwards may not know it yet, but they're all in the process of deciding what the classroom of the future will look like. They'll choose the device that works best for them -- be it an iPad, a PC or a traditional textbook -- and content providers will have to design software that works across each platform. Sean Devine, CEO of the e-textbook provider CourseSmart, says that's why, for a while at least, digital textbooks will have to match the layout of their print counterparts. "We believe that students will be sitting side by side in a classroom and not all of them will have iPads," he says. "Some of them may have the print book just as they have had for years. And they need to see the same thing -- they need to be literally on the same page." Inkling's Matt MacInnis says his company is also designing software that is compatible with the printed page, but he also thinks the iPad and similar tablet devices will be hard for students to resist. He says the era of the $180 textbook is ending and the time when you can download a chapter for $2.99 is only just beginning. That's why, when it comes to marketing his e-textbooks, MacInnis says he'll be aiming straight for the students. He says, "I can absolutely guarantee you that the guy with the book version is looking over the shoulder -- with envy -- at the guy with the iPad version." That, according to MacInnis, is just how it works.